In the Viet province of Quang Nam, nothing is more breathtaking than the Marble Mountains. It is a string of five marble and limestone peaks majestically protruding out of a valley between the cities of Hoi An and Da Nang. In the early 19th Century, it is said that Emperor Gia Long saw these peaks while passing through the valley. Emperor Long was also known as Nguyen Anh. He unified and ruled Vietnam until 1820 and founded the Nguyen Dynasty, one of the last dynasties in Vietnam. He was so awed by the five peaks and decided to name them using the Earth’s elements. They were named Kim Son (Mountain of Metal), Thuy Son (Mountain of Water), Hoa Son (Mountain of Fire), Tho Son (Mountain of Earth) and Moc Son (Mountain of Wood). Situated about 25 kilometers from Hoi An and nine kilometers from Da Nang, the Marble Mountains make for a very scenic bicycle ride early in the morning or late in the afternoon. A tourist’s curiosity and appetite for the strange and unique will no doubt be satisfied just by looking from a distance, much more when moving closer or actually climbing one of these peaks. The mountains have been hollowed out as they have been carved by ancient Buddhist monks as a beautiful hideaway and temple site. 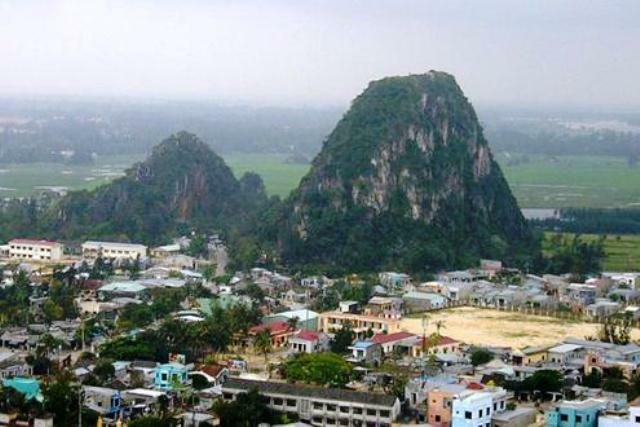 Tourists, nature enthusiasts and adventure seekers regularly come to the Marble Mountains (or Ngu Hanh Son), but not as often or as purposeful as Buddhist devotees. It is a popular pilgrimage site with the many Buddhist temples and grottoes built on the mountains and caves. The most visited mountain is Thuy or Water Mountain. A steep and dangerous climb over 157 stone steps leads to a pagoda on top of Water Mountain. The mountain walls are littered with Buddha, animal and sacred image carvings that have been etched there through the centuries. There are winding tunnels that are sure to keep a tourist’s curiosity and imagination running. The winding steps lead to the main cave, which continues on to the highest peak possible. Once on top, visitors gasp at the panoramic view of the surrounding landscape. The city of Da Nang can be seen from the distance. There are caverns below where there are statues of sinners being tormented in the lower parts of the spirit world. The downside to this otherwise heavenly tourist experience are the hawkers and vendors at the foot of the mountains selling overpriced, poor quality marble statues and paperweights, which they claim to have been made using marble from Marble Mountains. This, however, is clearly untrue since the marble deposits here have been depleted many years ago. What’s on sale are cheap marble statues from Central China. The foot of the mountain is unattractive, dirty, dusty and definitely not fitting of the great mountains that stand on it. The climb is not for children, be warned. Also, travelers must wear reliable sneakers and carry a flashlight because it is very dark inside the cave. A flashlight not only guarantees safety but also allows a tourist to better see the intriguing cave interior. A visit to the Marble Mountains is definitely a must when in Hoi An or Da Nang.